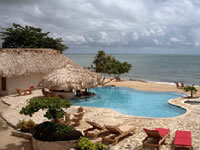 Almond Beach is an exceptional luxury beach hotel in Hopkins Village and the Stann Creek District of Southern Belize. This property is situated right next to the Jaguar Reef Lodge and close to many of Belize's national parks, Mayan ruins, and the great Barrier Reef where you can enjoy scuba diving, snorkeling and fishing. At just 30 minutes from Almond Beach is the famous Cockscomb Basin Wildlife Sanctuary, which is also known as the Jaguar Preserve. The Almond Beach Hotel offers private, waterfront casitas that have been designed for pleasing all your needs. All rooms feature air-conditioning and are equipped with a safety box, a fridge, water cooler, coffee maker, hair dryer, CD player and a ceiling fan. Most of the furniture is hand carved by Belizean craftsmen, while the bathroom murals are from Mexico. Artwork, slate carvings, pots and statues are from local artists in Belize, Guatemala and Nicaragua.